We are distributors and approved installers for the Wellmaster flexible rising main. N.B. For warranty purposes all installers have to be approved by Wellmaster. At our facility in Leigh we can undertake the fabrication of both mild steel and stainless steel flanged rising mains up to 12″ diameter. When required we use an outside facility for Scotchcoating rising mains. If required we can cut and screw pipework from 1″ up to 6″ diameter. Head plates can be fabricated in steel from 6″ diameter up to 48″ diameter and can be supplied complete with all necessary openings for the rising main, dip tubes, cable glands etc. 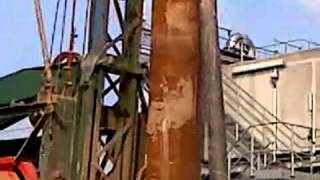 Scotchcoating of head plates is carried out using an outside facility. We can prepare head works from the head plate on the borehole by adapting the existing pipe work or by replacing it with new. Where necessary head works can include all gate valves, none return valves, water meters and sample taps. Minor civil engineering projects can be undertaken using our own labour, excavators and equipment. 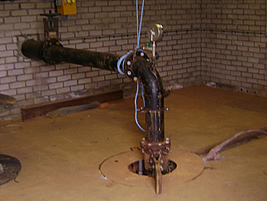 This can include the laying of water mains from the head works into the relevant supply pipe work. Well head chambers can be constructed in either pre-cast concrete or brick. We can provide either 30tonne carrying capacity covers and frames or above ground level concrete plinths. 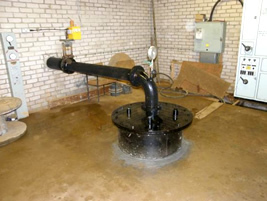 Our staff can design and build pump houses. We can fabricate steel cabinets to house controls and equipment and design them to be suitable for installation adjacent to the borehole head works.